“Enriching the youths’ involvement in community peace and resiliency building”. What a wonderful theme for this event! The camp dealt with the youths’ role and involvement in peace, mostly in their very own communities, homes and families. It was just a four day event, but I can tell you it changed me a lot, especially in my understandings and beliefs about different kinds of cultures and religions in the Philippines, especially in Mindanao. It also broadened my learning about the trending topic in the senate and in our country, the Bangsamoro Basic Law (BBL). This event also bridged me with new friends from different places and provinces, not just personally but also through Social Media (mostly in Facebook). It also gave me the opportunity to know more about my Nanay’s friends, co-peace workers and her previous works. As a youth who has been living in a rural area, it was not easy for me to adapt and embrace staying in an urban city, since the venue of the event was CdeO which is one of the most progressive and developed cities in the Philippines. Because of that, my Nanay explained to me many things about the place I’m going to. During our camping at Lumbia, many things happened, many opportunities were opened, many friends came and plenty of knowledge was shared and voiced out by different peoples. Among the participants was me, who learned from our older co-campers and speakers. As an overall learning and reflection in the camp, I learned that we the youths could create and develop a more peaceful, progressive, chaos-free and better community than corrupt, bias and self-centered politicians/leaders. I also learned the effects of violence, especially its mental and psychological aspects. Another thing I learned was how to lessen the stress in ourselves & finding our inner peace. And by simply breaking the cycle (“pag buslot sa ligid”) brings a big possibility to end the increasing illiteracy and poverty rate in our country, as our dear speakers have said. If there is one thing that is very unforgettable and memorable to me, it was the time we all sung the song “A New Friend Found” while holding our hands and forming a double circle. During that time, I saw my fellow campers’ slightly teary eyes saying: “I am not ready to leave this camp guys”, “I will miss you all so much”, and the common phrase “until we meet again”. I heard their very voices singing heartily with all emotion, and felt their overwhelmed hearts each time the song nearly finished and we turned to rotate the circles we made. And I’m very proud that I was part of it, and that I’m one of them. To the Balay Mindanaw staff, especially those people that have become part of my life and have helped me discover myself in such a very short period of time: arigatou, juz agnina, thankees, tichue, daghang salamat and in whatever language, a very big thank you to all of you guys for the experience, learning, knowledge and everything you imparted to my life. God Bless us all. 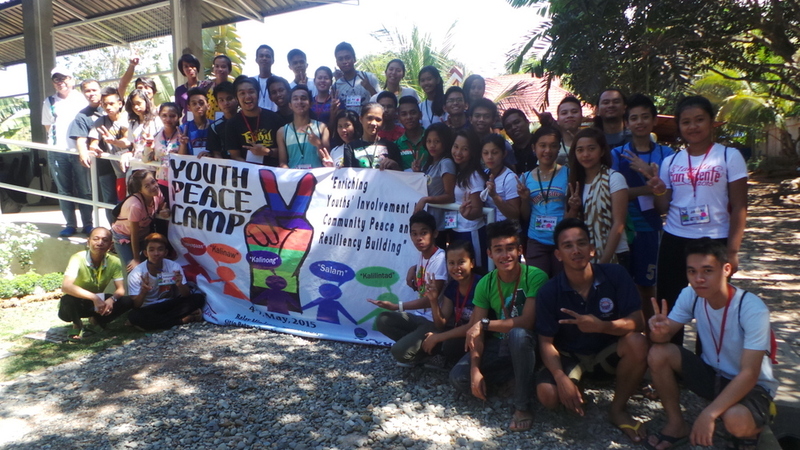 Mabuhay Youth Peace Campers!